Finding quality care in a nursing home is a very serious issue, especially when you are looking for a home for a loved one. Most nursing home residents are particularly vulnerable and reports of abuse, neglect and substandard care have become commonplace. In order to help families find a safe place for their loved ones and to encourage nursing homes to provide better care (in theory, nothing promotes compliance quite like the government airing your dirty laundry), the Centers for Medicare & Medicaid Services (CMS) began publicly reporting nursing home reports in 1998 and and started giving nursing homes ‘star ratings’ in 2008. So the question must be asked: Should you rely on the government nursing home ratings when choosing a nursing home? We wanted to dig into this further, so together we worked with data analysis and data visualization company 1point21interactive in order to do a more in depth analysis of the data. The map above shows the distribution government ratings for nursing homes in Pennsylvania according to the data on the medicare.gov website. Click on any point on the map to see the name of the nursing home and the rating. As the images below show, we can see the distribution of nursing home ratings in the state is fairly evenly distributed. Is the Overall Star Rating a Good Measure of Quality of Care? While the star rating system is user friendly, it has been widely criticized for several reasons; ranging from it’s heavy reliance on self reporting data to facilities inflating staffing numbers to raise scores. Additionally, the overall rating is heavily weighed on the outcome of the Health Inspection measure. Therefore, it is entirely possible for a facility to have a high overall score – a 4 or 5 star rating – while scoring very poorly in one of the other two categories. This is especially apparent – and alarming – in the Quality Measure category. In Pennsylvania alone, we identified 49 nursing homes with an overall rating of 4 or 5 stars that were given a 1 or 2 star score in the Quality Measure Category – nearly 20 percent of all homes that earned a 4 or 5 star rating. This issue isn’t unique to Pennsylvania, we found facilities fitting this same description in every state – a total of 1127 facilities as seen in this map below. So, what exactly are the quality measures? The Q.M. score is based on 11 (eight long-stay measures and three short-stay measures) of the 18 quality measures (QMs) criteria from the Minimum Data Set on the Nursing Home Compare website. Each measure is given equal weight, but is adjusted for prevalence in each home. Percent of residents whose need for help with activities of daily living (ADL) has increased – This covers late-loss ADLs which include bed mobility, transfer, eating and toileting. It reflects worsening performance on two late-loss ADLs by one functioning level or one ADL by two or more functioning levels. Percent of high risk residents with pressure ulcers (sores) – This concerns Stage II-IV pressure ulcers. Percent of residents who have/had a catheter inserted and left in their bladder – Reports those who had an indwelling catheter in the last seven days. Percent of residents who were physically restrained – Concerns residents restrained on a daily basis, which can affect ADL. Rules stipulate that restraints should be removed for 10 minutes every two hours to allow for exercise. During sleeping hours, the patient’s position should be changed based on their needs. Percent of residents with a urinary tract infection – Covers those who have had a UTI in the past 30 days. Percent of residents who self-report moderate to severe pain – Patients who have reported frequent moderate to severe pain within the last five days. Percent of residents experiencing one or more falls with major injury – This reports those have fallen within the past calendar year or target period. Percent of residents who received an antipsychotic medication – Those who received this medication within the target period. Percent of residents with pressure ulcers (sores) that are new or worsened – Patients with new Stage II-IV sores. Percent of residents who self-report moderate to severe pain – This concerns all reports of any frequency. Percent of residents who newly received an antipsychotic medication – Patients who received medication during the target period but not on their initial assessment. These measures are important because they have significant health and safety implications. High instances of pressure ulcers can indicate that patients are being neglected. Nursing homes can help prevent or treat pressure ulcers by frequently changing the resident’s position, proper nutrition, and using soft padding to reduce pressure on the skin. The use of antipsychotics has been shown to increase risk of death in patients with dementia, so facilities with significantly higher than average use of them may be putting their residents at risk. Patients losing too much weight could mean that the resident isn’t being fed properly, their care isn’t being properly managed, or that the nursing home’s nutrition program is inadequate or poor. When people see an overall 4 or 5 star rating, they are given the impression that a facility is providing the best possible care. 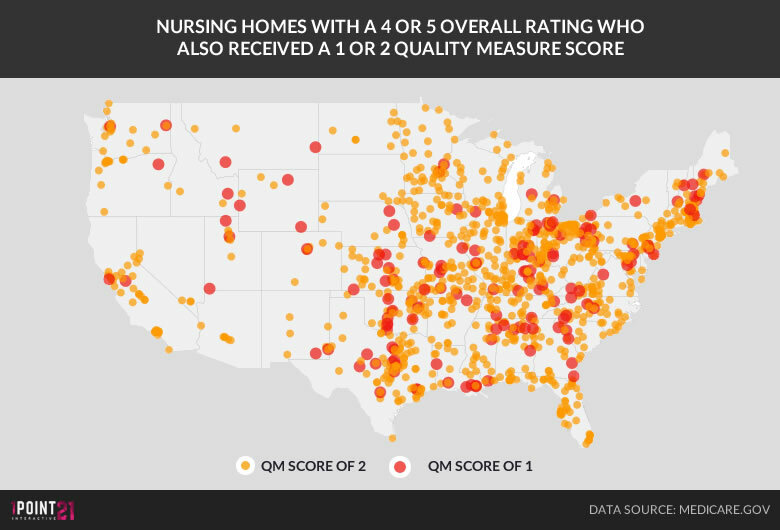 However, for these nursing homes that score poorly in the quality measure area, this may not be the case. In fact, as aforementioned, the low scores may be indicative of practices that put residents at a serious adverse health risk. Take Harlee Manor for example. This facility has a 5 star overall rating, yet over 18 percent of it’s residents have pressure ulcers (bed sores) – that’s more than three times the national average of 5.8 percent The facilities use of antipsychotics and percentage of patients who lost too much weight were also significantly higher than the national average. Similarly, Aristacare at Meadow Springs boasts a 5 star overall rating, but 10 percent of residents have a catheter inserted and left in – again over three times the national average. *We identified 13 more but the Medicare website did not provide data for these other nursing homes. So How Does a facility earn a 5 star overall rating despite being given just a 2 in QMs? The composite score is taken from each of the three categories to determine an overall score – the home’s ‘star rating’. An average or a median of the three is not applied. The process for awarding points, especially in the aforementioned QMs category, was changed last year. If a facility earns a 1 in the QMs section, their overall score is reduced by one point, so it’s impossible for a facility to earn a 5 overall in this scenario. But even a 4-star facility would be given strong consideration. So only taking one star away in this regard does a disservice to the consumer. There is a set point total by which the number of stars is awarded in the QM category. The number of points necessary to earn two or more stars was among the changes made to the rating system last year, which increased the threshold for what is considered quality care. However, the QM rating has very little effect on the overall score. If the home is on the Special Focus Facility list, it can only earn a maximum of three stars. If it only gets one star in the health inspection category, then it can only earn two stars overall. The reason that facilities can earn a 4-star rating overall despite a 1-star QM rating is that the facility starts with five stars, and then is awarded or subtracted points based on how they do in each of the three categories. So say a facility gets five stars on health inspection, five stars on staffing but only one on QM, they will still be given four stars overall, because they were awarded a point for how well they did in the first two categories. A facility cannot be given more than five stars or less than one star. QM data is updated throughout the year every quarter. Are fines included in a nursing home’s rating? CMS has two ways to hold nursing homes accountable for poor care or outright negligence: Imposing fines and withholding Medicare payments. However, the fines are based solely off what is found in the health inspections and they do not factor into a home’s star rating. While they aren’t perfect – it’s important to know if the home your loved one was in is getting fined and what they are getting fined for. The table below displays the fines given to nursing home facilities in the state over the last 3 years. So, should you rely on the government’s star rating when choosing a nursing home for a loved one? No. While a facility’s star rating can be a helpful tool, you should always look deeper and examine several factors. Careful examination of the Quality Measure scores, Medicare fine and payment suspension data, along with personal visits should all be used in order to make the best possible decision for your loved one.